RawStraw is Kalyan Nagar's health cafe with everything from waffles to French toast and desserts on its menu. But everything comes with a healthier alternative in terms of ingredients. Plus, these guys do vegan options too. RawStraw was opened to give the city an option to eat healthy and guilt-free food. It all started when the owners, Sagar and his wife Mahitha, couldn’t find many places to eat healthy food and thus opened RawStraw. The cafe focuses on healthy food — what you see is what you get. No colours or preservatives are added, and nothing in the cafe comes out of a can, is processed or has added adulterants. No white sugar, maida or refined oil either. The cafe space is cosy, comes with a calm and peaceful vibe, and is sparsely done up with plants, white chairs and tables, and framed slogans. RawStraw is a vegetarian restaurant with a few egg options on their menu as well. Head there for the all day breakfast and try their breakfast platter (eggs of your choice, herbed mushrooms, hash browns, breakfast salad, toasted bread and a choice of juice). You can also sample their spinach and feta cheese omelette and the frittata as other options. RawStraw also does pancakes and waffles — indulge in their Jowar pancakes with fruit compote and honey, or the Belgian Chocolate Brownie Waffle, and feel no guilt whatsoever. Hipsters, you will be happy to know that RawStraw also does avocado on sourdough toasts, and you can add a sunny side up to this, to make it a power packed breakfast. 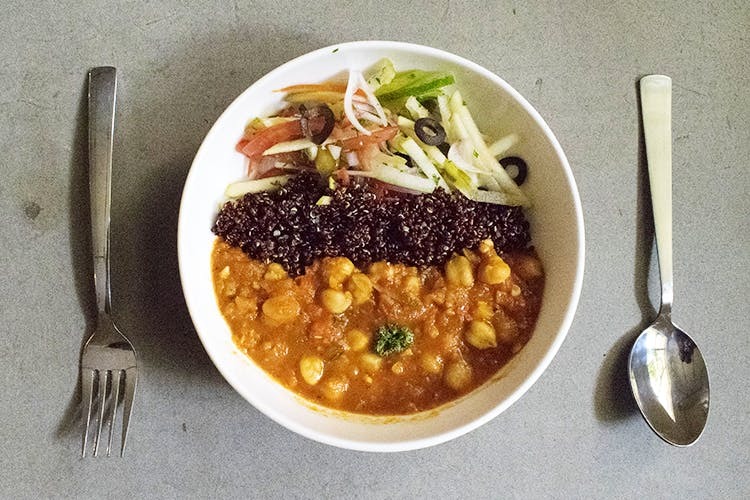 They also have healthy and trendy Buddha Bowls with options such as a Mediterranean style veggies served on a bed of millets or a Mexican chickpeas Buddha bowl served with quinoa and green apple salsa. What’s not to love? Plus, smoothies, detox juices, tea and coffee. For dessert, try their homemade ice cream, with flavours like avocado coconut and banana peanut butter. If you are dining here solo, we recommend taking the high chairs near the glass cafe front for people watching!